Canon has updated its compact PIXMA all-in-one device line-up with five new TS-series devices. Each new model features a high-quality ink system, Bluetooth connectivity for wireless printing and scanning and the new, interactive Message in Print app. TS9120. Gold body color enhances any room. "At Canon U.S.A. we are continuously striving to provide the highest quality and experience for our customers," said Yuichi Ishizuka, president and COO, Canon U.S.A., Inc. "Expanding on our previous PIXMA models, this new series will help make photos and at-home projects even more memorable with an advanced color ink system and the new Message in Print app." Bluetooth connectivity to print and scan wirelessly from the new printers using the Canon Print App. The Message in Print App for compatible iOS devices, allowing embedded messages to appear on the screen of the recipient's device when holding it over the printed photo received. Messages can range from videos or photos with animation and background music and may include text, dates, location information and URLs. The result combines a physical photo with an enhanced digital component such as music or video. Attractive new colors to further enhance the room's interior. The PIXMA TS9120 is available in a sleek gray, gold or red. The PIXMA TS8120 is available in black, white or red. The PIXMA TS6120 and PIXMA TS5120 are available in black or white and the PIXMA TS3120 is $79.99 and available in white. The PIXMA TS9120 Wireless Inkjet All-In-One Printer is $199.99 and the PIXMA TS8120 Wireless Inkjet All-In-One Printer is $179.99.The PIXMA TS6120 Wireless Inkjet All-In-One Printer is $149.99,the PIXMA TS5120 Wireless Inkjet All-In-One Printer is $99.99 and the PIXMA TS3120 Wireless Inkjet All-In-One Printer is $79.99 and available in white. 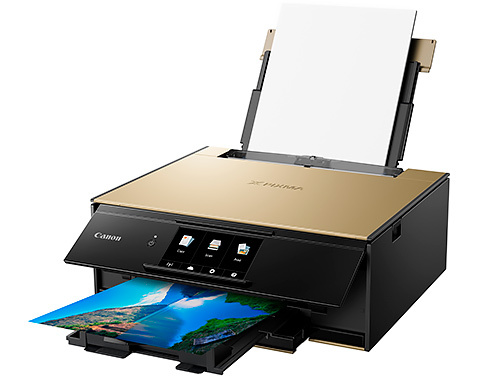 MELVILLE, N.Y. -- Packing even more features in a small package, Canon U.S.A. Inc., a leader in digital imaging solutions, has announced five new PIXMA TS-series Wireless Inkjet All-In-One printers. The PIXMA TS9120, TS8120, TS6120, TS5120 and TS3120 Printers deliver a host of new features, while maintaining the sleek, compact body and versatile print, copy and scan functionalities of their predecessors. Each new model is equipped with a high-quality ink system, Bluetooth connectivity for wireless printing and scanning and the new, interactive Message in Print app, soon to be available for users of compatible iOS devices in the fall of 2017. These new models are the ideal tools for tech gadget lovers, creative crafters and image makers to print and scan their creations in the most beautiful fashion. The new line of printers preserves popular features from the previous series of PIXMA TS All-in-One printers, including but not limited to cloud printing capabilities through a compatible smartphone or tablet device using Canon PIXMA Cloud Link and high-resolution scanning and support for a variety of paper sizes and types. The TS9120 and TS8120, like previous flagship models, provide easy-to-use super-sized 5-inch and 4.3.0-inch LCD touch panel screen to allow users to simply select copy, scan or print, as well as two-way paper feeding and an auto-duplex printing option. The Message in Print App for compatible iOS devices, offering a new level of personalization when sharing photos -- Simply embed a code onto a customized photo through the app, print and send. The app allows embedded messages to appear on the screen of the recipient's device when holding it over the printed photo received. Messages can range from videos or photos with animation and background music and may include text, dates, location information and URLs. The result combines a physical photo with an enhanced digital component such as music or video and ultimately, makes sharing memories that much more memorable. Attractive new colors are available throughout the lineup that will further enhance the room's interior. The PIXMA TS9120 is available in a sleek gray, gold or red. The PIXMA TS8120 is available in black, white or red. The PIXMA TS6120 and PIXMA TS5120 are available in black or white and the PIXMA TS3120 is $79.99 and available in white.